The department provides training of basic and complete higher education, prepares architecture bachelors, masters and experts in “Architecture Buildings and Structures”, provides a special typological, methodological and regulatory framework in the design of objects in “Architecture” provides training of graduate students. 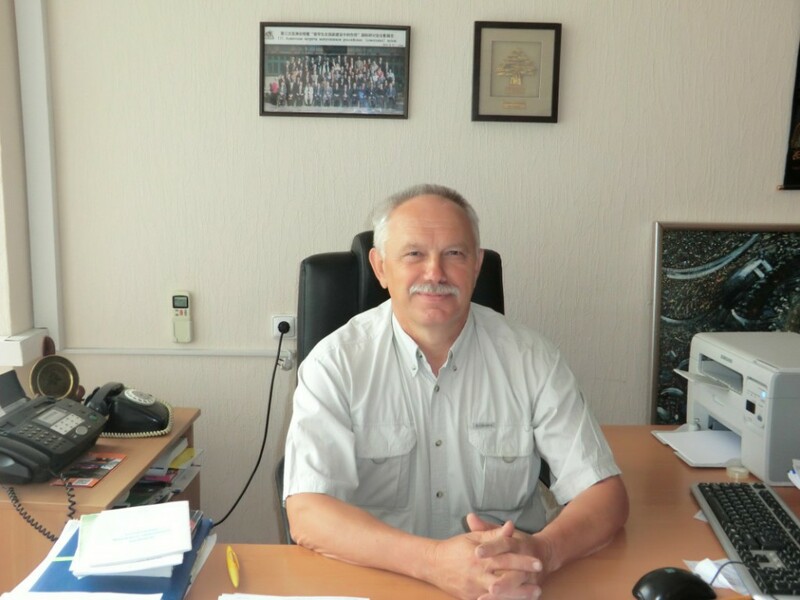 Head of Department – Prof. Dr. Vadim V. Kutsevych . 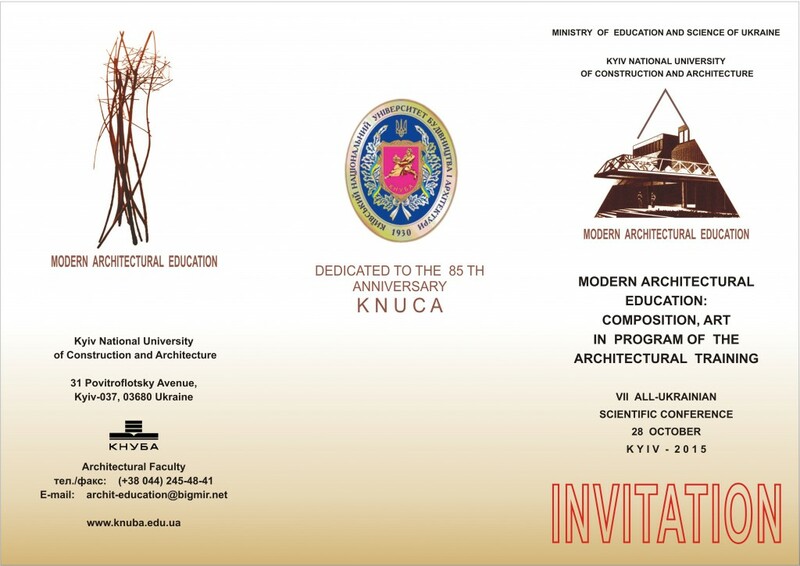 History began with a moment of union faculty utilities KPI and Architectural Faculty Art Institute under the auspices of the Kiev Civil Engineering Institute in 1930 From the outset, the Department is not only the leading element of training qualified personnel, but also the nucleus, initiating other relevant architectural departments that exist in the Kyiv National University of Construction and Architecture. During the time the faculty existed, teachers, experienced architects and scholars passed their knowledge and skills to more than two thousands of young architects whose work subsequently made a significant contribution to the development of Ukrainian architecture and who were deservedly awarded the State Prize of Ukraine and the USSR, the high rank and distinguished architects have made significant progress in the development of science, practical and administrative work. The department has students from China, Iran, Turkey, Lebanon, Turkmenistan and other countries. Students get their theoretical knowledge during the period of practice: educational, creative and productive. Students, generally, pass their productive practice by individual contracts with companies and organizations, along with the planned places for contracts, organized by the Institute. Course planning is made by the lecturer developed and approved by the Department of the programs that are constantly updated and adjusted to relative trends in contemporary architectural design and construction. Based on the theme of the course design, the guidelines embedded in the Ukraine DBN and other regulations are developed. Diploma assignments offer planning of real objects in specific sites in Kyiv and other cities of Ukraine. Field projects are adjusted annually in accordance with the plan of the city of Ukraine, the need to reconstruct the objects, announcement of competitions. Diploma planning is performed based on state building codes and regulations adopted in Ukraine, the latest building technologies and designs. 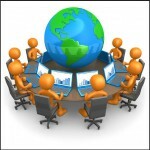 All thesis projects are carried out under the supervision of the department created using a PC. Scientific and methodological activities of the department are directed to do research in the latest techniques of architectural design, develop promising types of residential and public buildings, further improvement and development of new methods for optimizing architectural town planning decisions in general and in the educational process – in particular. Students enrolled in the department (Group 12-62 ABS A and B 12-62), and young scientists – the department systematically conducts research work: prepared and sent to print articles, manuals, guidelines, performed competitive projects and development. Students and young scientists department regularly participate in national and international conferences, symposia and seminars. High percentage among the student graduates are masters of architecture. Currently there are 7 post-graduate students, 1 Phd student and 1professor, who completed his doctoral studies in 2011. 3 master and 1 doctoral dissertation are prepared in the first edition. 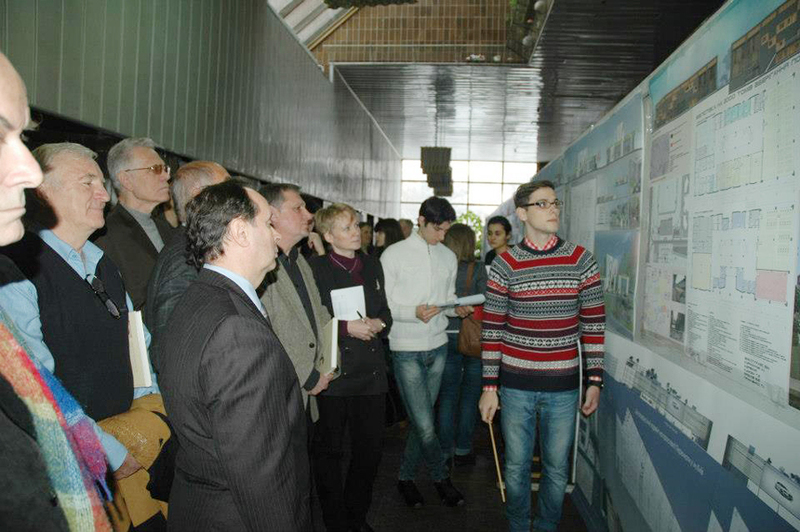 In graduation projects competitions, that are conducted among architectural universities of Ukraine, our diploma graduates consistently hold high prizes. In 2012, on the review of the graduation projects contest, held in Kharkov, 17 diploma graduates were awarded diplomas of the first and second grade. A special diploma was awarded to the head. Chair, Professor. Kutsevych V. for the publication of the manual. The Department CADBS study 12 groups of students 6.1 courses Faculty of Architecture (Group 12-A, 12-B, 22-A, 22-B, 32-A, 32-B, 42-A, 42-B, 52-A , 52-B, 62-A, 62-B). 1. Architectural Design – 1 – 6 course – taught by all teachers of the department within 6 creative architectural and educational workshops. (Heads workshop: dok.arh. Prof. Kutsevych VV, Candidate Arch. Prof. Ezhov S.V. candidate . arh.as.prof. Orekhov BV, kand.arh. as.prof. Zen’kovich N.G. , as.prof Korol V.P., as.prof. Divak VI). 6. Fundamentals of typological analysis in architecture buildings – As.prof. Divak V.I. 9. Architecture residential buildings – (5 year) – Cand . Arch. Prof. Ezhov S.V. 10. Architectural barrier-free environment – (5 year) – dok.arh. Prof. Kutsevych V.V. 11. 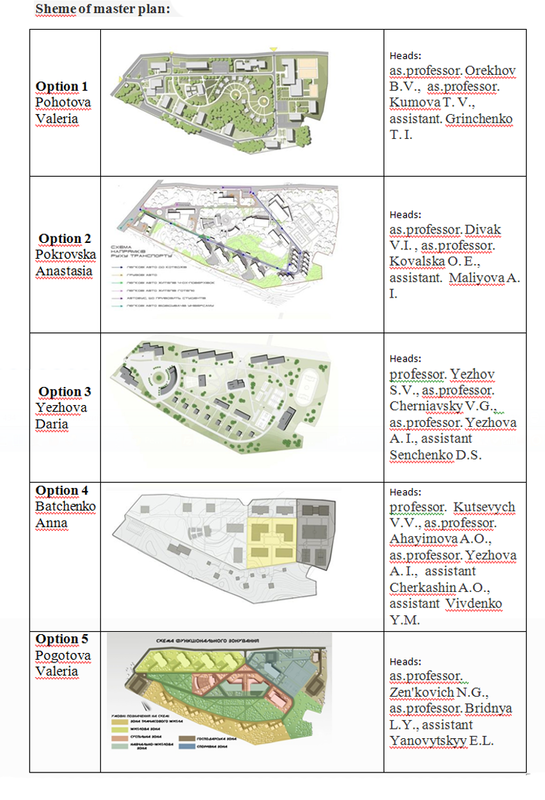 Architecture of temporary residence (5 year) – as.prof.Kovalska O.E., as.prof. Bridnya L.Y. 12. Architecture of facilities for passengers – (5 year) – as.prof. Kumova T.V. 13. Architecture Religious Buildings and Structures (6 year) – dok.arh. Prof. Kutsevych V.V. 14. Architecture of retail, catering and consumer services (6 year) – Candidate .. Arch. Prof. Cherniavsky V.G. 17. 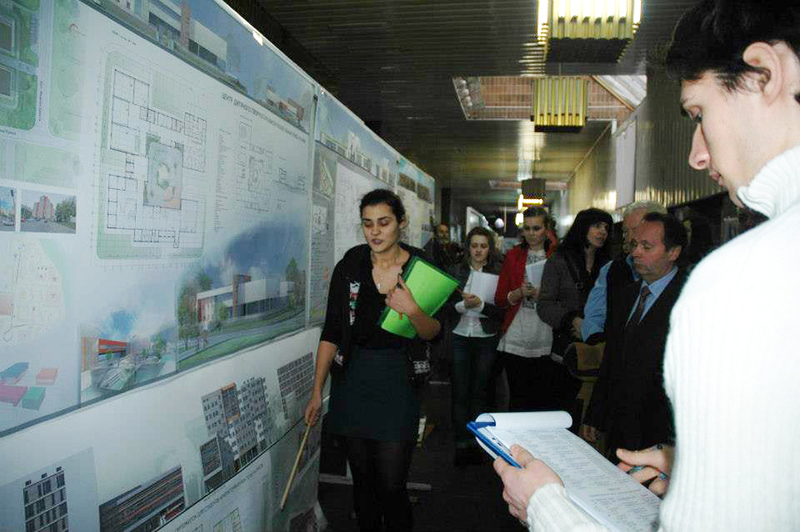 Research in the field of architectural design civic buildings and facilities – (6 course – masters) – dok.arh. Prof. Kutsevych V.
recommendations for writing papers and diploma projects in the course of architectural design, as well as with special courses which are conducted according to the curriculum department, preparing papers and monographs. All subjects provided teaching materials and teaching aids. During 2012 the lecturer prepared following scientific and teaching publications: 2 textbooks: “Synthesis of Arts” (Textbook stamped Mona) – kand.arh. Prof. .. Cherniavsky V.G., Kuznetsova I.A., Kara T. Vasileva, Chegusova Z.A. – NAU-K., 2012 – 318 p., “Architecture of temporary residence” (educational Guide) – as.prof. Tkalenko V.Z .,as.prof. Bridnya L.Y. – KNUCA – K., 2012 – 60 p.; Regulations – National Standard BS-H V.22-31-2011 “Guidelines on construction of buildings and civil engineering elements of accessibility for persons with visual and hearing “- dok.arh. Prof. Kutsevych V.V. – K. Mizhrehionbud Ukraine, in 2012 – 24 p., Published 29 scientific articles (including the 11th foreign editions). Teachers were reports of 17 to 5 scientific conferences and participated in 15 international architectural workshops (3 of which were outside of Ukraine). By order of administration of the department developed project proposals developed design offers educational and recreational complex KNUCA in the village. Pyatikhatki Kyiv region. 1. 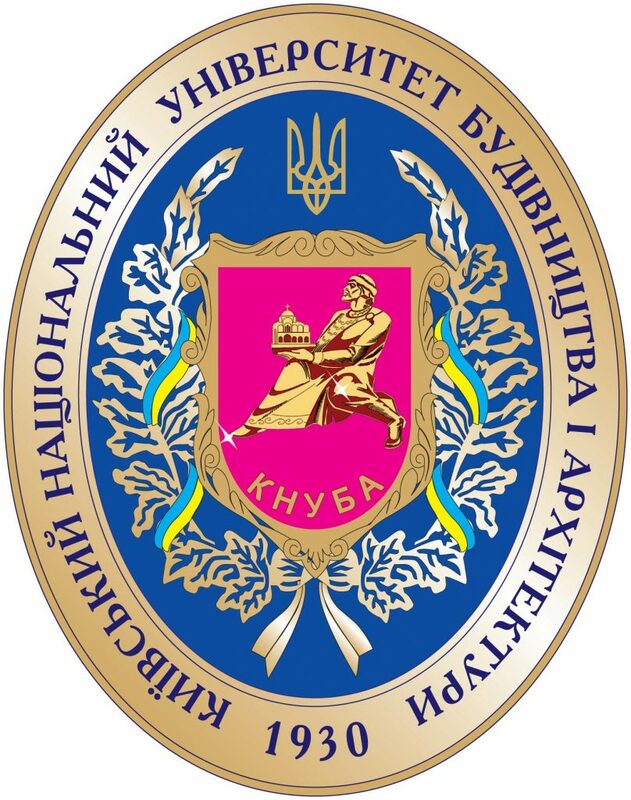 Kutsevych Vadim V. – Head Chair, Doctor of Architecture, Professor. 2. Cherniavsky Vladimir G. – candidate architecture, professor. 3. Yezhov Sergey V. – Candidate architecture, professor, Honoured architect of Ukraine. 4. Orekhov Boris V.- candidate architecture,as.professor. 5. 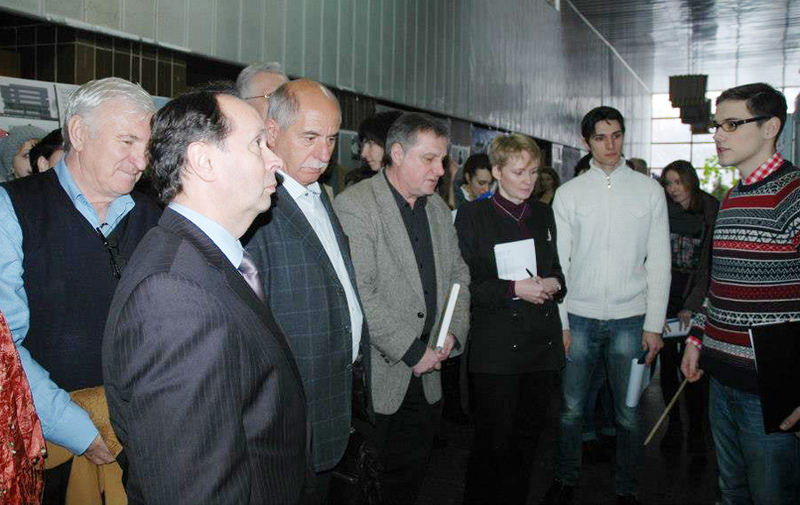 Kashchenko Tetyana O.- candidate architecture, as.professor. 6. Ahayimova Anastasia O. – candidate architecture, as. professor. 7. Zen’kovich NataliaG. – candidate architecture, as. professor. 8. Korol Vladimir P. – as.professor. 9. Kovalska Oksana E. – as.professor. 10. Divak Victor I. – assistant professor. 11. Bridnya Larisa Y. – as.professor. 12. Yezhova Alexandra I. – as.professor. 13. Kumova Tamara V. – as.professor. 14. Galak Catherine T. – assistant. 15. Maliyova Alexandra I. – assistant. 16. Selyvanov Oleksii I. – assistant. 17. Grinchenko Tatiana I. – assistant. 18. Vivdenko Yuri M.- assistant. 19. Khmelnytska Anna V. – assistant. 20. Cherkashin Anton O. – assistant. 21. Senchenko Daria V. – assistant. 22. Yanovytskyy Eugene L. – assistant. 23. Tsymbalyuk Elena V. – assistant. 24. Otkalenko Mary Y. – assistant. 25. Chizmak Daria M. – as.professor. Kim. 209, 211 – Dept. APTSBS. Kim. 213 – Head. Department APTSBS – Kutsevych Vadym V.
Workshop: 111 (Kutsevych V.V. ), 115A (Korol V.P. ), 117A (Zen’kovich N.G. ), 110A (Divak V.I. ), 303A (Ezhov S.V. ), 301A (Orekhov B.V.).